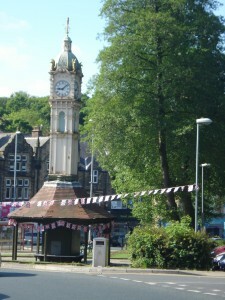 For over 10 0 years the clock has been a feature of the community. However it has not always been here. 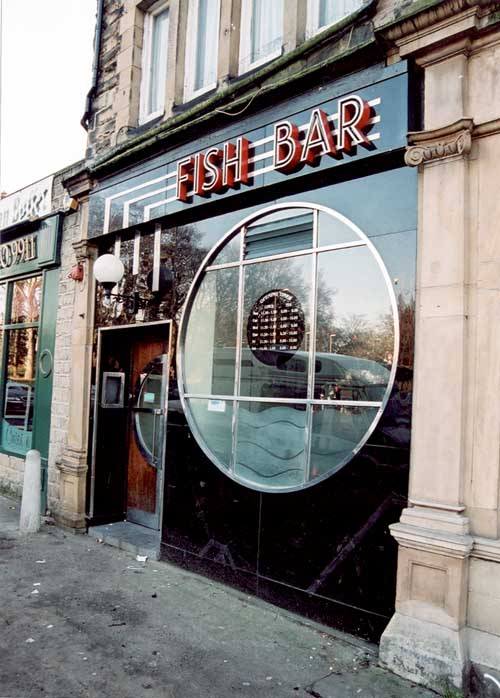 It was originally designed to be in the Leeds Kirkgate Market. 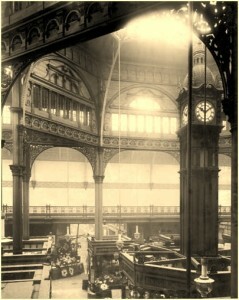 Here is a picture of the clock in its original home in 1911. 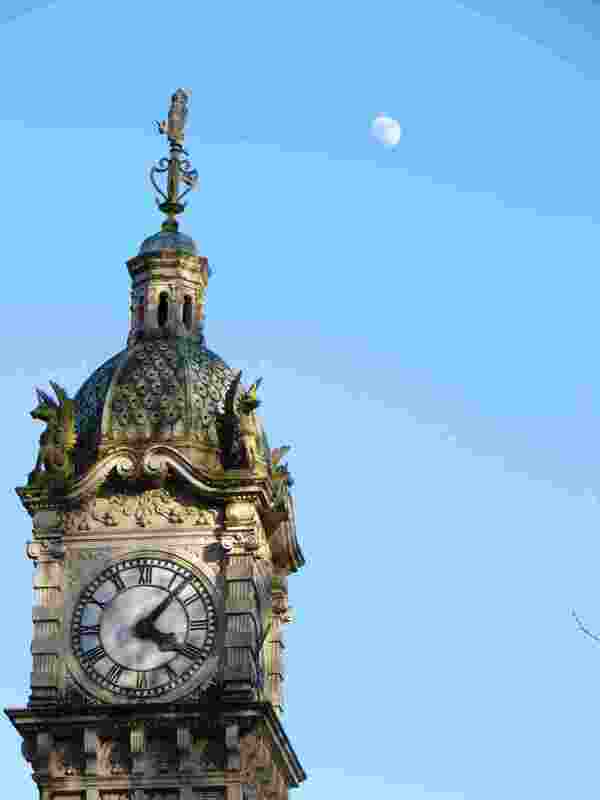 The clock was designed and built by the well known Leeds clockmaker William Potts and Sons. It was then part of the newly refurbished Leeds Markets. 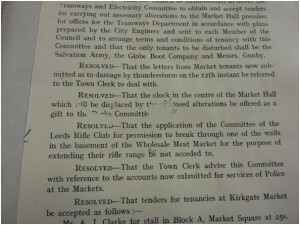 Leeds had been granted City status in 1893 and the new City Council were anxious to ensure that the market was worthy of the City. 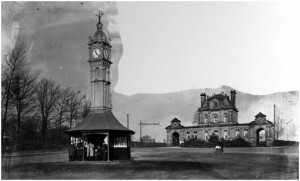 The clock was installed in the Market in 1904. However when it was decided to create a new entrance at the market it was also decided that a new home had to be found for the clock. Much debate took place and a decision was made to offer it to the Training College at Kirkstall Grange (now part of Beckett University – successor to Leeds Metropolitan University) in return for a replacement wall clock. For whatever reason – perhaps because they were not keen to go to the expense of supplying a replacement clock – that offer by the Markets Committee was turned down. 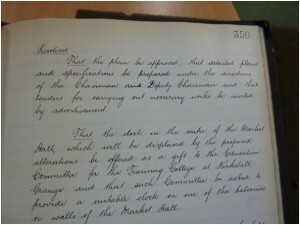 A fe w months later there is a record of a decision to offer the clock to the Parks Committee. 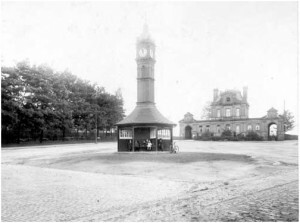 The clock was removed from the Market in 1912. It seems that for a period it was kept in storage. 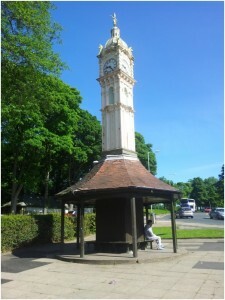 It is not known precisely why the Parks Committee decided to site the clock in Oakwood. However it was in 1912 that Roundhay and Seacroft, the two parishes that comprised the Leeds Rural District, were absorbed into the City of Leeds. The Leeds Rural District had come into being in 1894 as the successor to previous rural sanitary authority, which had consisted of the poor law guardians for the area. The absorption of these parishes into Leeds City was not met with wholehearted approval by the residents of Roundhay and Seacroft. In the subsequent week the paper reported the situation somewhat more pithily. “in a topic last week we mentioned an incident that occurred during the Local Government Board Inspector’s visit to Roundhay on the occasion of the City Council’s previous and unsuccessful application for incorporation of that suburb. 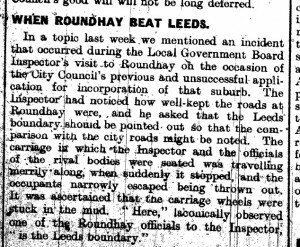 The Inspector had noticed how well kept the roads at Roundhay were, and he asked that the Leeds boundary should be pointed out so that the comparison with the city roads might be noted. The carriage in which the Inspector and the officials of the rival bodies were seated was travelling merrily along when suddenly it stopped and the occupants narrowly excaped being thrown out. It was ascertained that the carriage wheels were stuck in the mud. 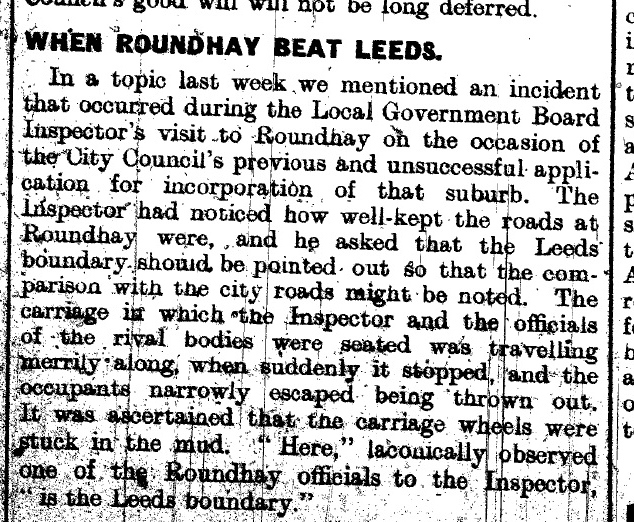 “here” laconically observed one of the Roundhay officials to the Inspector, “is the Leeds boundary”. It is possible that the lack of enthusiasm for the merger expressed may have influenced the Parks Committee to attempt to demonstrate the benefits of the merger by deciding to erect the clock in the newly acquired Oakwood. If that was the case then it did not meet with universal approval. Readers of the New Leeds News express doubts as to whether a tram shelter for tram passengers is really necessary. The Parks Committee don’t appear to be wholly committed to the project because they decide that they will only erect it if the Tramways and Electricity Committee agree to contribute towards the cost. This leads to inevitable delays. 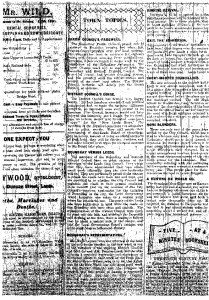 In due course the Tramways Committee agrees to contribute £75 and on 5th May 1913 a tender to carry out all the building work for a total cost of £299 is accepted. We don’t know when the clock and shelter was opened to the public because there was no opening ceremony but the Yorkshire Evening Post of 5th November 1913 has a picture of the clock describing it as both ornamental and useful – so we can conclude that it was in use by that date. The picture on the left is of the Clock just before the outbreak of the First World War in 1914. Yo u can see that it is very much out in the open. The building in the background is the Parks Department building referred to above. It was demolished in the late 1930s. 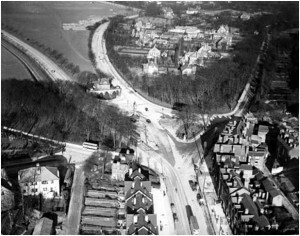 The rather atmospheric picture on the right was taken in 1915 and because there are no leaves on the trees we must conclude that it was taken in either early spring or late autumn. What is striking compared to today is the almost complete lack of traffic of any sort. The trams ran up past the left of the clock as we look at it – through where the car park now is. This can be seen from this aerial view of the clock taken in 1937. 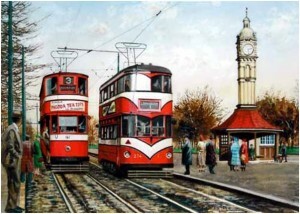 On the right is a colourful painting of a tram scene at the Clock painted in 1953 by Pete Lapish. The trams stopped running in around 1958. Despite that the tram shelter has continued to be a popular meeting place and somewhere to sit and chat. Over the next year or so it is our intention to record people’s memories of the clock and we will make some of those memories available on this website. The clock was never designed to be outside and the vagaries of the Leeds weather have taken their toll. It is in a sorry state – but remains an iconic monument in North Leeds – from a not very promisong start it is now our treasure – and we intend that it will continue to be a treasure for people in North Leeds for many years to come. We will record the memories of the past and do what we can to ensure that it is there to provide happy memories in the furture. Just across the Road from the clock is another Grade II listed building with an Art Deco frontage of black glass panels, which has been selling fish and chips since 1934.